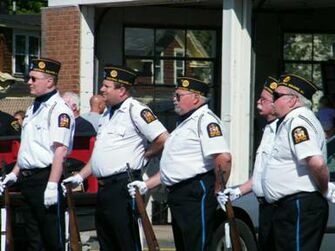 Observance: American Legion Post 915 of Central Square begins its observance each year on Memorial Day at 9:00am. The parade route is usually from Tucker Ave up Route 11 heading north to the center of the village. Once in the “square” there is a ceremony to honor and remember our deceased armed forces veterans. About 9:30 am is the “Fly over of F16s”. Following services the parade proceeds to Hillside Cemetery for further salutes and remembrances. Memorial Day, originally called Decoration Day, is a day of remembrance for those whom have died in our nation's service. There are several different versions of how and where Memorial Day got its start. However, Waterloo N.Y. was officially declared the birthplace of Memorial Day by President Lyndon Johnson in May 1966. It really is not important who was the very first to celebrate Memorial Day, what is important is that Memorial Day was established. Memorial Day is not about division. It is about reconciliation; it is about coming together to honor those who gave their all. Memorial Day was officially proclaimed on 5 May 1868 by General John Logan, national commander of the Grand Army of the Republic and was first observed on 30 May 1868, when flowers were placed on the graves of Union and Confederate soldiers at Arlington National Cemetery. The first state to officially recognize the holiday was New York in 1873. By 1890 it was recognized by all of the northern states. The South refused to acknowledge the day, honoring their dead on separate days until after World War I (when the holiday changed from honoring just those who died fighting in the Civil War to honoring Americans who died fighting in any war). It is now celebrated in almost every State on the last Monday in May (passed by Congress with the National Holiday Act of 1971 (P.L. 90 - 363) to ensure a three day weekend for Federal holidays), though several southern states have an additional separate day for honoring the Confederate war dead: January 19 in Texas, April 26 in Alabama, Florida, Georgia, and Mississippi; May 10 in South Carolina; and June 3 (Jefferson Davis' birthday) in Louisiana and Tennessee. 1933: In 1933 the Central Square Memorial Day activities were led by the American Legion started with a march to the village park for services at the Veterans' Memorial Tablet. Following services they went to Hillside Cemetery to the graves of Glen Fuller and Edwin Baxter for services. 1934: In 1934 the village band led the way from the town building on Fulton Street to the village park for a short service. George Perfield acted as the marshal. Marchers then preceded to hillside Cemetery for prayer and an address by Rev. A. E. Blunden. Next a patriotic reading was given by Mrs. E.E. Church after which a salute was fired and taps sounded in memory of World War veterans, Glen Fuller and Edwin Baxter.